Just a Hot Pink Cooler. No Big Whoop. One Fat Frog Restaurant Equipment offers more complimentary services than any other used commercial restaurant equipment dealer in the entire universe. Every Thursday the One Fat Frog Restaurant Equipment delivery crew makes free delivery runs to different parts of the state including Gainesville, Jacksonville, Ocala, Tampa, St. Augustine, Lake City, etc.. All of One Fat Frog Restaurant Equipment’s stock of used commercial restaurant equipment come with a 30 day parts and labor warranty. And as the proverbial cherry on top, One Fat Frog Restaurant Equipment will give any used coolers, freezer, display cooler, etc. a custom paint job absolutely free – even if you want your fridge hot pink. 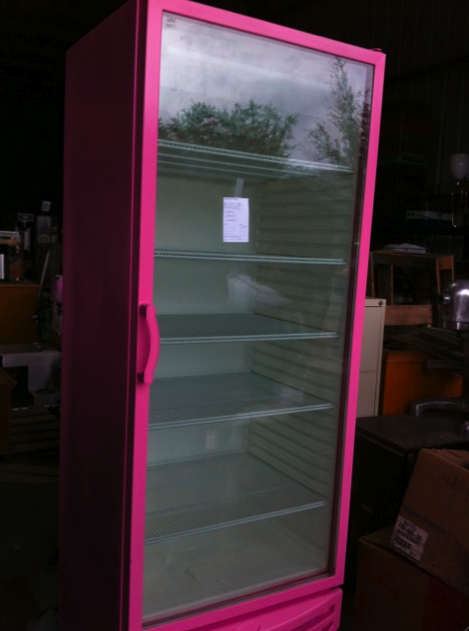 Above is a single glass door fridge that one of One One Fat Frog Restaurant Equipment’s clients wanted painted hot pink. She got the idea when Google Girl was telling her about the complimentary paint job service and stated “We’ll paint it any color you want, even hot pink.” The client’s eyes lit up and a few days later, One Fat Frog Restaurant Equipment delivered to her gym a hot pink fridge. Our tech who delivered it showed up during a unique dance class for women…but that’s another story. So if you’re in the market for a royal purple fridge or a tangerine dream display cooler, give One Fat Frog Restaurant Equipment a call and we can accommodate your insane color ideas no problemo. One Fat Frog Restaurant Equipment has an easy financing plan – even if your credit would make the devil himself weep and curl into the fetal position, One Fat Frog Restaurant Equipment can still get you approved for all of the used commercial restaurant equipment you need! One Fat Frog Restaurant Equipment also welcomes package deals and quick cash deals on the entire stock of used commercial restaurant equipment.